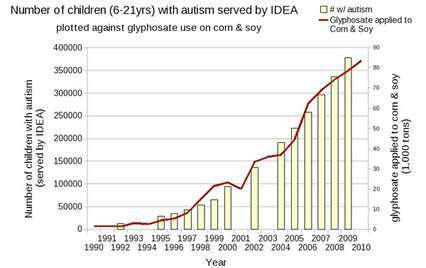 Autism is now a disorder that is officially being linked to several causes involving synergistic toxicityspecifically between vaccines, our food, the environment and some degree of genetic susceptibility. This month, the USDA released a study finding that although there were detectable levels of pesticide residue in more than half of food tested by the agency, 99% of samples taken were found to be within levels the government deems safe, and 40% were found to have no detectable trace of pesticides at all. The USDA added, however, that due to “cost concerns,” it did not test for residues of glyphosate. Let’s repeat that: they never tested for the active ingredient in the most widely used herbicide in the world.“ Cost concerns? How absurd unless they mean it will cost them too much in terms of the special relationship between the USDA and Monsanto. You may recall the revolving door between Monsanto and the federal government, with agency officials becoming high-paying executives and vice versa! Money, power, prestige: it’s all there. Monsanto and the USDA love to scratch each others’ backs. Clearly this omission was purposeful. About the author: Dave Mihalovic is a Naturopathic Doctor who specializes in vaccine research, cancer prevention and a natural approach to treatment. Prediction based on Roundup’s devastating effect on gut bacteria. Glyphosate appears to be the most pervasive chemical on the planet (a bit like plastic and even more dangerous, if that’s possible), virtually everyone of us has some of it inside us (just like plastic). They spray the damn stuff around the building I live in and on the streets I walk along. I might add that it’s my local council (Lambeth) that does the dirty deed. I spent several fruitless weeks trying to contact Lambeth over the issue but was defeated by endless ‘Press 1 for this… Press 2 for that…’ and automated emails that promised a real human would contact me (outsourced to Capita) but nobody called, nobody emailed and I finally gave up. State agencies have created an electronic wall around their activities which locks us all out! And they called it democracy. Go to the Council meeting, and raise the issue. Raise it in local freesheets if they have ‘readers mail’. Go to your councillor’s surgery (most have them). Go to your MP’s surgery. Don’t give up, and be sure to print out the article and give them a copy.